I woke up with the Full Moon beckoning out my window, ran downstairs & grabbed the camera to take this shot but when I was out at the back gate I heard the kitchen door slam… I was locked out in my birthday suit in the middle of the night! Old Man Crow was sound asleep and not easily woken by my knocking politely on the door so I grabbed a very tiny towel which was hanging on the fence, got the ladder out of the shed, climbed up on the roof and tapped on our bedroom window… I am so very glad he woke up, just had to share now it’s time to get more sleep! Oh, Mo, that’s a great story! I wonder if any of the neighbours saw you. Probably not, or the police probably would have visited by now. 4am here and I can’t sleep. Maybe I should pop out to look at the moon. Hi Carol I always get up at this time & phew!!! the neighbours didn’t notice, thank goodness! It was almost a nightmare but at this stage of the game it just made me laugh & brought me to my senses re what really matters! I had been lusting after a fabulous French coat but after finding out how much it cost via a friend who is fluent in French & finding out what it feels like to be caught out naked I really don’t need it! What a great story. i wish I was there taking a photo of you climbing the roof, naked and alight by the moonlight. I laughed and laughed. That will teach you to sleep naked! This habit quickly ceases when one has a 12 year old daughter who sees nakedness as err! Mo, you are a scream…..what a great way to wake up…for me that is..a real chuckle.! Reminded me of a time when we stayed overnight in a place that we were cleaning up to move into to in Prahran & I went to the outside loo and same thing, door clicked shut & I couldn’t get in. My future flatmate was asleep in the front room & couldn’t be woken. There had to be another way but that meant climbing over a fence, down a laneway,up another side street & back into our street . Thankfully I wasn’t naked but I only had a short summer dressing gown on & not much else. Like you tho, I don’t think anyone saw me but after that I always placed something between the door & the door jamb….wasn’t funny at the time but your story bought it all back. Thank you for the memory…& the moon looks wonderful. I noticed the wind was up as i was heading for the back gate and the thought did pass through my moonstruck brain that I hadn’t snipped the lock or put the brick in front of the door, it was an er… ummm… let’s say an interesting experience, still chuckling all these hours later! What a great story – lucky he’s not deaf, if it happened to me I’d have no chance of getting in! 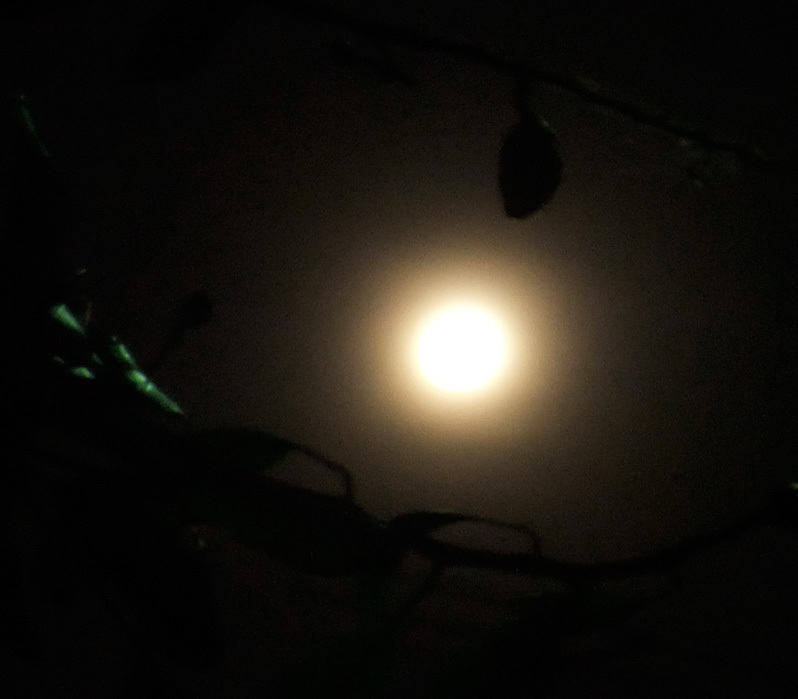 Wonderful shot of the moon, it was worth it. let’s catch up this Silly Season, it’s been too long! we’re both still laughing & y’know the Old Man Crow is so cool! he woke up, thinking someone was trying to climb in the window, then shook his head in disbelief when he saw it was me (that look was priceless) and came down and opened the door! did she ever find the wild thing was in her bedroom? We went to get a neighbor (a big macho guy with a gun! Oy), who came in and found nothing. Many hours later her returned home husband found a baby possum hiding in the very back of a closet. Good thing the oh so brave neighbor man didn’t find the little guy! Haha What a story…what a memory! this is such a riot !!! you remind me of that old song — “Wild Women Don’t Get the Blues”…. Wow what a great song! just listened to Cass Elliot with the Big 3’s version & then went back further & found Ida Cox who wrote it back in 1924 will find Cyndi Laupers now! I had never heard the song & googled it! we don’t have to remember anything any more! Lol……… Mo that is the best story!! In fact, it’s going in my sidebar. hehe! still laughing days later & am just so glad the neighbours were polite enough not to notice!